Why does your organization or brand exist? Why should anyone care that it does? Why do you do what you do every day? I love Simon Sinek’s TED Talk and book, Start with Why. Understanding the why of your brand or business provides a clear vision that can inspire you and your team, and — as you plan the growth of your business — can help illuminate ways to align your brand values with your audience’s values. 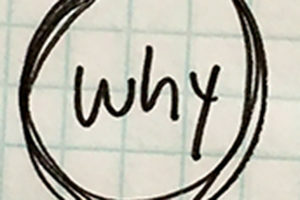 After years of telling every workgroup and roundtable I’ve been a part of to watch Sinek’s TED Talk, someone asked what was my business’s why. Because communication is the lifeblood of relationships. Just like with personal relationships, brands need to communicate well if they are to connect and maintain strong relationships. Design is a powerful and effective way of thinking, planning, and making ideas and information clear and relatable to people. In other words, design is a tool for communicating. Design is an industrial-strength how that can help deliver your why. Relationships that fuel growth for your brand and business. Sinek does a wonderful job of explaining how leaders and organizations can start with why to align and inspire their teams in this short version (only 5 minutes) of his TED talk. Why not watch it now?